Location of Dickson in Dickson County, Tennessee. Dickson was named for Congressman William Dickson, as was Dickson County. Dickson is located in south-central Dickson County at 36°4′17″N 87°22′28″W﻿ / ﻿36.07139°N 87.37444°W﻿ / 36.07139; -87.37444 (36.071485, -87.374539). It is bordered to the east by the town of Burns. U.S. Route 70 passes through the north side of the city as Henslee Drive; it leads east 40 miles (64 km) to Nashville and west 62 miles (100 km) to Huntingdon. Interstate 40 passes through the Dickson city limits 5 miles (8 km) south of the center of town, with access from Exit 172 (Tennessee State Route 46). I-40 leads east 37 miles (60 km) to Nashville from Exit 172 and west 92 miles (148 km) to Jackson. According to the United States Census Bureau, Dickson has a total area of 20.0 square miles (51.9 km2), of which 20.0 square miles (51.7 km2) is land and 0.1 square miles (0.2 km2), or 0.41%, is water. The city center sits on the Tennessee Valley Divide, with the southwest side of the city draining via the East Piney River to the Piney River, then to the Duck River, and then to the Tennessee River, while the northeast side drains via Turnbull Creek or Jones Creek to the Harpeth River and thence to the Cumberland River. As of the census of 2000, there were 12,244 people, 4,934 households, and 3,300 families residing in the city. There were 24,325 people in the 37055 zip code. The population density was 743.4 people per square mile (287.0/km²). There were 5,280 housing units at an average density of 320.6 per square mile (123.8/km²). The racial makeup of the city was 87.86% White, 8.83% African American, 0.46% Native American, 0.56% Asian, 0.77% from other races, and 1.54% from two or more races. Hispanic or Latino of any race were 1.94% of the population. There were 4,934 households, out of which 34.2% had children under the age of 18 living with them, 46.5% were married couples living together, 16.8% had a female householder with no husband present, and 33.1% were non-families. 29.1% of all households were made up of individuals and 11.6% had someone living alone who was 65 years of age or older. The average household size was 2.42 and the average family size was 2.97. In the city the population was spread out with 27.2% under the age of 18, 9.0% from 18 to 24, 28.9% from 25 to 44, 20.6% from 45 to 64, and 14.4% who were 65 years of age or older. The median age was 35 years. For every 100 females, there were 86.7 males. For every 100 females age 18 and over, there were 79.8 males. The median income for a household in the city was $34,549, and the median income for a family was $42,632. Males had a median income of $32,733 versus $23,138 for females. The per capita income for the city was $17,654. About 12.6% of families and 15.3% of the population were below the poverty line, including 19.3% of those under age 18 and 14.2% of those age 65 or over. The City of Dickson is governed by a mayor and City Council. Mayor Don Weiss, Jr., has served in that office since 1993, making him the longest-serving mayor of Dickson. The City of Dickson is divided into four wards, each of which elects two members to the City Council. Councillors are elected to staggered four-year terms, with one councillor from each ward being elected every two years. As the Mayor of Dickson is only a part-time job, a City Administrator is also appointed to oversee the day-to-day operations of the city government and its budget. The City of Dickson Parks and Recreation Department maintains and operates various green spaces in Dickson, including sports areas, playgrounds, lake areas, and community centers. The Hotel Halbrook Railroad & Local History Museum was placed on the National Register of Historic Places in 1990. ^ a b "Geographic Identifiers: 2010 Demographic Profile Data (G001): Dickson city, Tennessee". American Factfinder. U.S. Census Bureau. Retrieved January 6, 2016. ^ "Annual Estimates of the Resident Population: April 1, 2010 to July 1, 2014 (PEPANNRES) – Tennessee". American Factfinder. U.S. Census Bureau. Retrieved January 6, 2016. ^ McKinney., Clay. "City of Dickson, Tennessee - Mayor Don L. Weiss Jr". www.cityofdickson.com. Retrieved 2018-06-03. ^ McKinney., Clay. "City of Dickson, Tennessee - City Council". www.cityofdickson.com. Retrieved 2018-06-03. ^ McKinney., Clay. "City of Dickson, Tennessee - Administrator Tom Waychoff". www.cityofdickson.com. Retrieved 2018-06-03. ^ McKinney., Clay. 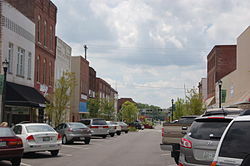 "City of Dickson, Tennessee - Parks". www.cityofdickson.com. Retrieved 2018-06-03. ^ Frizzell, Scott (Spring 2011). "Not Just a Matter of Black and White: The Nashville Riot of 1967". Tennessee Historical Quarterly. 70 (1): 26–51. JSTOR 42628733. Perhaps, with great skill and deference, his students could reach the coveted middle-class status that he had attained, owning a ranch in nearby Dickson in addition to his president's residence on campus, provided by the university. Wikimedia Commons has media related to Dickson, Tennessee.